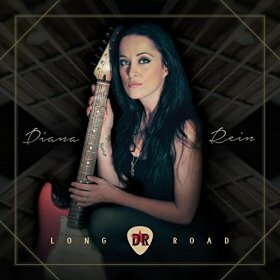 I just received the newest release, Long Road, from Diana Rein, and it's got strong commercial potential. Opening with title track, Long Road, Diana Rein shows real clarity in vocal performance on a well written ballad with ultra clean Fender guitar work. Very nice! Wild One has a thumping bottom and strong rock bones. A driving rhythm guitar line and aggressive lead guitar work gives this track real sting. Livin' Loud has a slinky feel warming up to a guitar infused rock break. Cool. Green Light has a power pop feel with a springy 3 chord drive under blues lead. Rebel With A Cause opens with a Latin flare but breaks down to a heavy footed rocker. A solid radio style track with modest guitar riffs keeps it simple. The Real Thing has a nice fat Fender guitar sound with with nicely written melody lines. Breakout guitar work on this track gives it another dimension but still staying mostly in the power pop area. Nice. Done Me Dirty, another strong radio entry has some stinging guitar riffs breaking the pop infused lyrics. Don't Walk Away is a sweet ballad written over a basic arpeggio. There is a real nice guitar solo on the track giving it a broader feel and Rein's vocals are strong, balancing her guitar work. Come Back Home has a well written melody and Rein's vocals are pushed nicely by a more powerful guitar solo giving it a bit more rock weight. Wicked is a real nice blues ballad with a rich guitar guitar intro. Backing down and allowing her vocals carry the load, Rein gives the track real cross radio airplay opportunities, before coming back with her most adventurous guitar work to this point, venturing into Big Brother territory. Very nice. Down, Down, Down opens with a primitive blues feel but kicks into power pop mode with driving drums and vibrant guitar riffs. My favorite track on the release is the closer, Peace, a really nicely written instrumental ballad for electric guitar. Clean tones through what sounds like a nice tube Super and sparks of jazzy guitar riffs gives this track true sparkle. Very nice closer to a strong vocal entry.